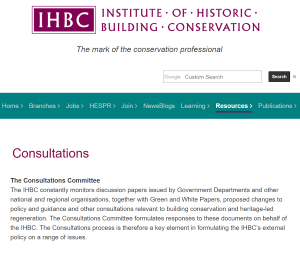 IHBC responds to NPPF consultation: Calls time on insubstantial distinctions in levels of ‘substantial harm’, seeks new settings policies, and more…. In its response to the revised National Planning Policy Framework (NPPF) the IHBC has urged government to call time on ‘substantial harm’ and ‘less than substantial harm’; to develop policies for setting, and to celebrate the differences between heritage types. The IHBC has submitted its response on the consultation from the Ministry of Housing, Communities and Local Government on the revised National Planning Policy Framework (NPPF). Despite Government commitments to maintaining levels of protection, changes to the weighting of policies might cause harm to heritage as the relative status of heritage policy is reduced. Concern over the continued use of heritage policies first used for PPS5 (March 2010), a document conceived to tie in with emerging heritage legislation that never came to pass. Such policies are now inconsistent with, and have an unsatisfactory relationship to, the statutory duties imposed by the Planning (Listed Buildings and Conservation Areas) Act 1990. A ‘one-size-fits-all’ approach to the definition of heritage asset which fails to recognise the differences between scheduled monuments, listed buildings, and conservation areas. Reuse of policies on on harm to significance. Instead of the negative approach of avoiding harm these policies should take a more positive stance and should emphasise sensitive, well-informed management of change. The retention of the distinction between ‘substantial harm’ and ‘less than substantial harm’ which is unhelpful and has resulted in much unnecessary argument in relation to planning decision-making. The Welsh Government has sensibly not found it necessary or appropriate to make the distinction between ‘substantial harm’ and ‘less than substantial harm’ in its Planning Policy Wales document. A noticeable lack of policy protection for setting and development within or affecting the setting of a heritage asset.